The spring season has finally come to a close and with the playoff run over, two athletes stuck out in their respective team’s recent performances. Both Newington’s Teddy Fravel and Southington’s Abby Lamson helped their squads make deep postseason runs. The Newington boys volleyball team won its fifth Class M title in the last seven years with a 3-2 win over Joel Barlow on Thursday. The 6-foot-7 basketball player was recruited by Newington head volleyball coach Curt Burns his freshman year during a game. Fravel uses his height to his full advantage when on the court and is always among the team leaders in kills. Fravel’s favorite part about volleyball is the friends he has gained. Fravel’s goal for his senior season is the same as it was this past year. The Southington softball team made it as far as the semifinal round of the Class LL state tournament. The Blue Knights fell 6-5 in a devastating loss to Amity, which ended up being the Class LL champion. Despite the loss, Lamson, the team’s junior catcher, played a pivotal role for the Blue Knights, not just in their final game, but really all season long. During her tournament run, Lamson had three hits, three RBI and one double with one run scored. Over the course of the season, she had 30 hits, 20 runs, 32 RBI and a batting average of .476. The catcher also recorded six stolen bases on the year. Although she is just a junior, Lamson has already committed to attend University of Massachusetts-Amherst, in the fall of 2020. There, she will continue her softball career as a Division I, Atlantic-10 athlete. 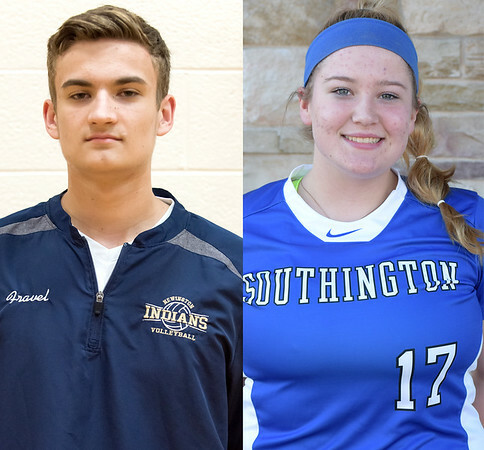 Posted in New Britain Herald, Athletes of the Week, Newington, Southington on Monday, 11 June 2018 20:55. Updated: Monday, 11 June 2018 20:58.